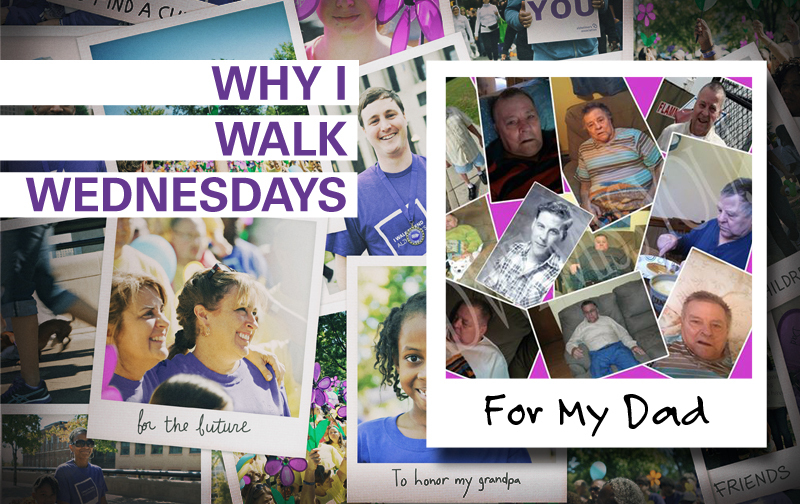 We walk for our grandmother, Georgia Green Johnson and for our dad, Eugene W Johnson, Jr.
Our story starts back in the late ’90s when we lost our grandmother to this horrible illness. We can remember walking into the nursing home to visit. She would be so scared and in a fetal position because she didn’t know who we were. It was horrible to watch how this illness had taken the strength of such a strong willed woman and turn her into this fragile person. Near her end we had stopped in to visit with her, I said, “hey Granny, it’s Teresa” she looked up at me and as she stared at me she had a tears roll down her face and then she smiled at me. I felt at that particular moment she knew who I was. It would only be a month later she would pass. In Oct 2010, our father was rushed to the hospital. He had a stroke. It was then our lives would change forever because our dad was diagnosed with Alzheimer’s. For me (Teresa), I immediately went into denial. I actually couldn’t bear to think that this man who was a work horse had this horrible illness. Our dad was the “Jack of all Trades” he had bulldozers, cranes and dredges.. the kind that build bulkheads and widen canals. He even had a fish farm raising red striped bass and catfish. When he was a younger man, he and our grandfather worked on building the Chesapeake Bay Bridge Tunnels (they were involved in the actual sinking of the tunnels and connecting them to the road). For me, I felt if I stayed away, it wasn’t true. As for my younger sister, (Tammy), she stepped up. She went to all his doctor appointments and would take him to her home over the weekends to give our mother a break. She and her husband went above and beyond to help care for our dad. As the illness progressed, our mother, his wife of 53 years vowed to keep him home. To keep him in the home he built for her some 54 years ago and had raised their 4 children in. At this point, I knew I had to start helping, I would go in the afternoon to sit with our dad while mom would do her bus route. It would be sometime later that we would start getting help in the mornings and then later we would receive help in the afternoons. Last year he had another mini stroke which left him really weak. Tammy could no longer take him to her home anymore due to him not being able to walk very well, so she would stay a night on the weekend to help mom out. By January 2014 things started turning worse with the illness. He would know us one day, the next he wouldn’t and the next day we were much younger in age which would confuse him as to why he knew us but just not at the age we were. By April things were steadily declining. My father was requiring constant care 24/7. We would have an aid in the morning and the afternoon. I would relieve the aid Monday-Friday and Tammy would relieve me. Weekends were a toss-up on whoever could do what. At one point, things were so bad that the hospital sent an RN to evaluate him. She told us that we could have until August but felt things were progressing faster than that. What our father did do before he started the spiral downhill in the earlier stages back in 2010, was he put a DNR in place, he released us of the burden to make the decisions of what he wanted…. his wishes were plain and simple. (with that said, that was easier said than done). Our normal lives were no longer. We were devoted to providing the best care that we could give to our dad. Our homes, our spouses, and our children were set aside because our plates were full. They were supportive of what we were doing for our dad. It was at this point Tammy, mom, and I knew what the meaning of “his caregivers” meant. In July 2014, Hospice was called in. Dad was no longer eating and his fluids were consistent to a cap of water every hour until he could no longer drink or swallow. For the most part he was incoherent and unconscious. Then one morning he just sat up as if he was never sick. He looked good, he knew us all but Hospice had told us before this that we would go through what they call “false hope”. It was 3 good days that we would cherish forever….as we watched as he slowly slipped away from us. On August 9th, in his home of 54 years with his devoted wife of 53 years, Tammy and I beside him, he lost his battle to this horrible illness. We walked last year for the first time. Our team “Forget-me-Nots”. This year we will walk again in honor of our dad. We walk to raise awareness. We walk to raise money to help other families and to help fund the research to end this thing.